Take a good look at the Jasper Leather Bar Stool Walnut & Brown, a classic design that is the epitome of traditional bar stool design. 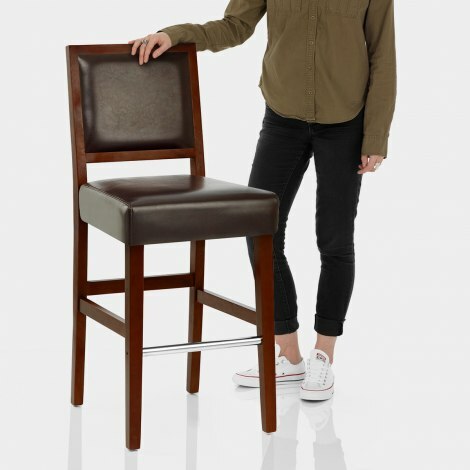 Delivering strength, sturdiness, and steadfast style, the Jasper Bar Stool will work wonders in your bar area. A genuine brown bonded real leather seat pad rests on the frame, and is matched by the similarly beautiful backrest pad. Further to this, a central space between the two components creates an open space, making an impact without cluttering your space. At once simple and elegant, it has been crafted with solid wood for classic cool. A chromed bracing bar helps to re-enforce the structure and creates a resting spot for your feet while the Jasper's inclusion of anti-scratch protective floor plugs means it's a practical purchase as well as a timeless one. 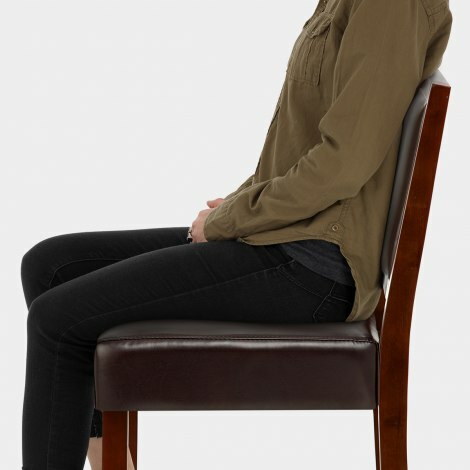 "Very high quality, comfortable and was delivered quickly"
Good strong, comfortable stool. Excellent value. This item was delivered the very next day after ordering. It was easy to assemble and lovely quality. Its the perfect height for my kitchen bar top and very stylish and comfortable. An excellent product. Stools are of a good quality and same as in the pictures . comfortable and of the right height . Looks as if they were made for our kitchen . Delivery etc re company was excellent. These chairs are very high quality, comfortable and was delivered quickly. Easy to assemble and look amazing.